Since the start of the App revolution we have seen some pretty amazing Apps, as well as a great deal of crappy designed and pretty much unusable Apps. I have always liked Apps that have a clear focus. Apps should not start with a menu asking what the user wants to do. Apps should start with the core functionality and with what the App is meant for, because the App designer already knows what the users want to do, when the App is started. 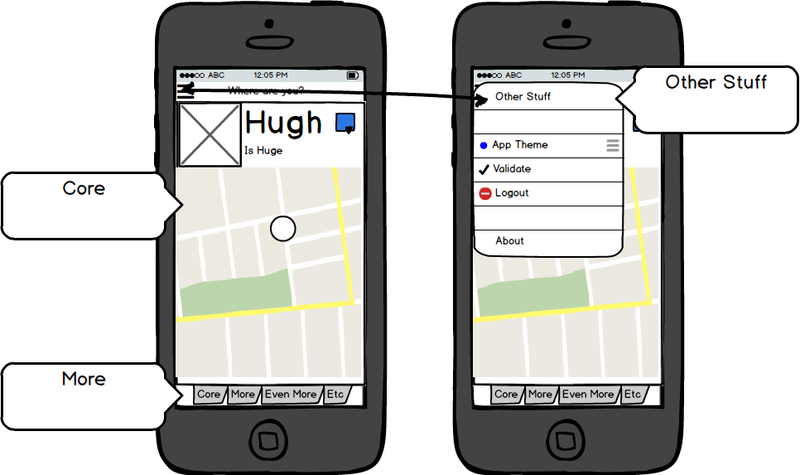 The App designer knows, because he researched and listened to the user group. I am not against menu like navigation to separate functionality in an App. It is however never the goal of the user to start with the menu. I have never heard a potential App user say: ‘As a user I want to use a menu’. Separation of functionality enables the App to be used at a broader level than remaining restricted to one functionality. I do not believe in one functionality per App. I do believe in one core functionality. The App focus: should be the core. The core functionality is the reason the App exists. It is the materialization of the most ‘epic user’ story. It is why the user opens the App in the first place, usually. So, this also, is what most of the screen real estate should be used for, when the user opens the App. It should be clear by now that this is never the menu. So where do we put the other valuable interaction that is logical to access in this App but not necessarily the most ‘epic of epics’? We use the first layer of navigation, the tab bar or action bar. By separating the additional App values from the core in this bar, we bring it clearly and logically in front of the user, without the need to ask him where he wants to start today. The user can easily access the functionality and doesn’t have to find his or her way around the App: it’s clear but not in their face. To make sure the App is still focused, there is only room for a couple of additional App values. Typically, the initial four fit the tab bar, the rest is one more click away. Now that we have our most epic and additional App values in place, we sometimes are left with some stuff that we have to add. Typically, stuff that is left, is a large part of what the users will never mention as a value. Think of security, login, and other configuration and settings. Stuff that has to be in the App because it matters to the working of the app but not so much to the user. This group of features – as we can hardly call these values – we can position in the Settings menu or the ‘Hamburger’-menu. This clear layered approach of core, additional App values and more stuff is logical and simple to get rid of the start-up menu and presents the user with an elegant and well-thought-through App design. Thinking of the core as an epic of epics works most of the times. However, context of the user can change the initial expectation of the user and influence the way we look at the user values. This context of location and time can also change the order of the values. Making one user value more epic than another, for now, in this context. By taking into account these user scenarios with context, we can be mindful of the expectations and adapt our solution to the user and usage context. Context-aware applications can assist us efficiently, so that we can accomplish our tasks with fewer clicks.